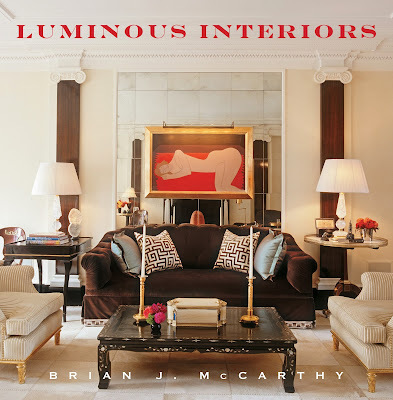 Recently named to Architectural Digest's esteemed list of Architects and Interior Designers, the 2014 AD100, Brian McCarthy has published a new book on his work, Luminous Interiors. Destined to be a classic for years to come, there are 200 color photographs of sumptuously finished rooms accompanied by his very personal and descriptive text. 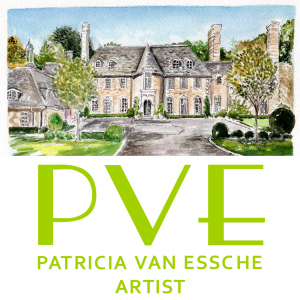 McCarthy joined the venerable Parish Hadley design firm in 1983, where he worked alongside Bunny Williams, who wrote a most admiring forward to this luxe book. Since starting his own firm in 1991, business has grown exponentially as has his elite client list. 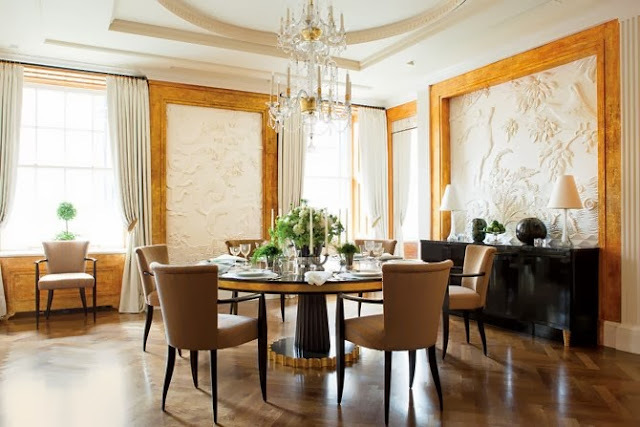 Atelier Mériguet-Carrère plaster panels carved with nature scenes surround this luxurious dining room. 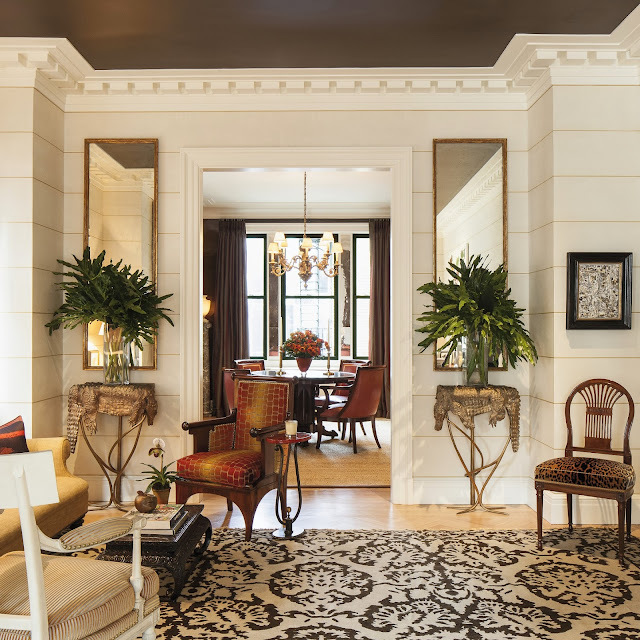 Wrapping his interiors in an envelope of equisite finishes, this designer works with artisans around the world sometimes having entire suites of rooms crafted at Feau and Sie in Paris. He uses materials such as gilt, silver leaf, lacquer, Venetian plaster, and bold architectural elements to transform spaces into his clients vision. Three elements, reflectivity, texture, and silhouette are hallmarks of McCarthy's interior designs, adding interest across a rooms "skyline". A pair of bronze crocodile sculptures by artist Claude Lalanne in the Manhattan apartment McCarthy shares with his partner. Art and sculpture fill every corner of his home down to the Alberto Pinto dinnerware and water glasses by Deborah Ehrlich. 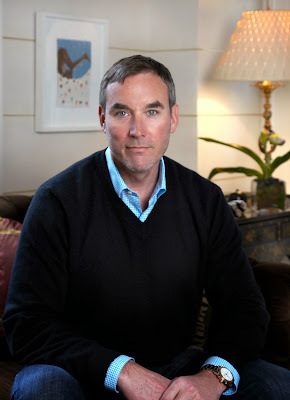 Many of McCarthy's clients have world renowned collections of art and as a collector himself, he believes that works of art are what give an interior design its "zing". An antique suzani from Madeline Weinrib graces this 19th-century iron four poster bed made in France. This home on the south shore of eastern Long Island has dining room murals based on Monet's Water Lilies. The porthole mirror is surrounded by sconces of amethyst and beaded glass. This is a book I will pick up many times and one that is a must for your library. I love the way he uses neutrals...such rich, warm designs. Thanks for the introduction, Karena! Un intérieur très élégant... Une très belle publication. Thanks for sharing and exposing me again to another fablous book! Bonjour mon ami... I hope all is well ...sorry I haven't been by - been between country and city home and up to elbows in renos. Love the brown accents. Timeless. Oh my goodness, what gorgeous interiors! I adore the modern/classic lines!!!! This is really my style! Is this a banner year for books or what!! so much inspiration and design education out there its amazng!!! Happy December, Karena! Your blog is not updating on my blogroll??? I just clicked over to see if you were posting. I'll have to reload it tonight. Glad I popped over. Looks like a beautiful book. PS - Showing your post from 5 weeks ago as latest. Looks like a fab book, will have to put on my list! I love the room on the cover of the book - so many great elements! This looks like a fabulous design book to add to my ever growing library! Gorgeous style and what a pedigree!! 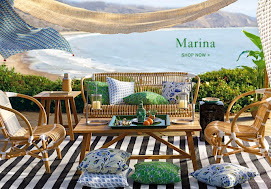 Hi karena, I love this post as Brian McCarthy is one of my favorite designers. I adore this book. Can't put it down!! I hope that all is well with you. Your thumbnail on my blogroll show last post 5 weeks ago. I clicked on it and it came here. Hello! This looks beautiful! Wishing you a wonderful Holdiay Season! Thank you for being my most loyal commenter!! These interiors are really beautiful. Hope you're weekend is going great! It is no wonder that he made the AD list of esteemed architects and designers…the rooms are exquisite..the definition of perfection.